While we hope you never have to use them, no lab is complete without the proper first-aid and safety precautions. 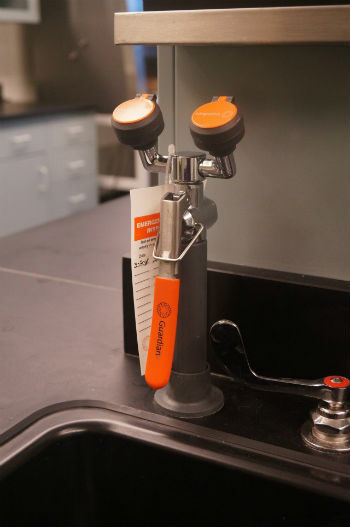 Safety equipment is crucial to any laboratory setting. Whether you’re lab is intended for grade-school students or seasoned industrial professionals, accidents are bound to happen. Be prepared with our safety products and design. Laboratory Design & Construction offers a wide variety of safety fixtures including emergency showers, eye & face washing stations and first-aid stations. Safety Cabinets – We offer sturdy safety cabinets to secure your lab’s more hazardous materials including acids, bases and volatile substances. These cabinets can be locked as an additional safety measure. Goggle Cabinets – Sturdy cabinets for safe storage of your lab’s goggle supplies. Showers – Emergency showers can be installed in labs where full-body exposure is a potential danger. This is especially important if large volumes of caustic chemicals or radioactive materials are present. Eye/Face Wash Stations – Every lab needs to have sufficient eye and face wash stations installed strategically throughout the lab. We use only the most trusted and reliable products for these critical lab fixtures. Safety/First-Aid Stations – Safety stations contain everything your lab needs for a first-aid response and can be installed directly onto the wall or kept in a clearly-marked cabinet. All of our safety equipment can be customized based on the specific work performed in your lab to ensure that you can respond immediately to any emergency, accident or injury. Contact us to learn more about our lab safety equipment and features. Laboratory Design & Construction, Inc.
© 2019 Laboratory Design & Construction, Inc.